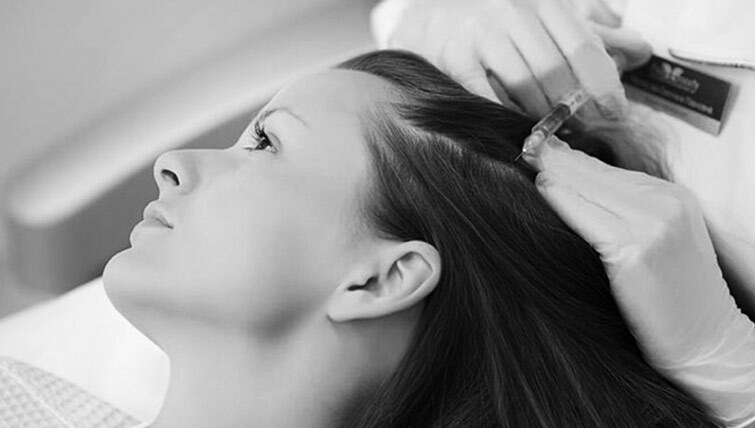 PRP today is one of the most commonly asked for procedures for hair growth and skin rejuvenation. This technique which was initially used in diabetic ulcers or wounds to improve their healing has become a popular treatment today in clinical aesthetic practice essentially owing to its safety profile, as it’s the patient’s own blood which is used for treatment. Platelets have essential growth factors in them which are utilized in this procedure to help hair growth and to impart radiance to the skin. Here 20 ml of the patient’s whole blood is taken and is subjected to a centrifugation process to achieve a platelet rich concentrate. This concentrate is then harvested and activated so that the platelets can release their growth factors, which are simultaneously injected into the scalp or the facial skin for them to do the needful. The growth factors then help in nourishing the hair and skin amongst other important things. Where all can PRP be done? 1. Androgenetic alopecia or patterned hair fall in males and females. 3. For nourishment of the skin – particularly suited for fine lines and mild wrinkles, dehydrated and dull skin. This is also popularly known as the vampire facelift as the patient’s own blood is utilized for rejuvenation of the skin. Is the procedure painful / when can I resume work? At Veya Aesthetics we take care to impart minimal pain to the patient while carrying out this procedure. Local injectable or topical anesthesia is used for the procedure and patients are usually comfortable during and post the procedure. One can resume work straightaway after the procedure. b) An individual, who is not more than Hamilton – Norwood grade III/IV not keen on going in for hair transplant procedure. d) Individuals with dehydrated and dull skin and / or fine lines and mild wrinkling. PRP has a great safety profile as it’s the patient’s own blood injected back into their skin leading to minimal chances of untoward reactions. The patient may experience a sensation of heaviness in scalp lasting for not more than 1-2 hours.